Feminine 14k Gold Baby Pink Topaz and Ethiopian Opal ring. 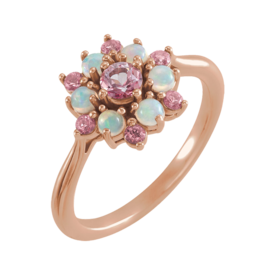 You'll love this romantic floral style ring in 14k Rose gold. Opals measure 2.5mm round and Pink Passion Topaz are each 2mm round. Simply lovely ring. Beautiful 14k White gold Swiss Blue Topaz and 1/4ctw diamond ring. 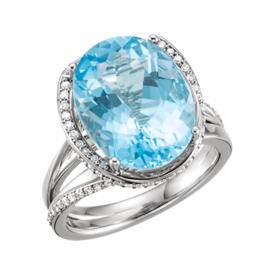 Delightful design features two round Swiss Blue Topaz that meet in the middle. Gems measure 4mm round and the two total .37ct. Accent diamonds along either side equal 1/4ctw. Such a pretty ring. 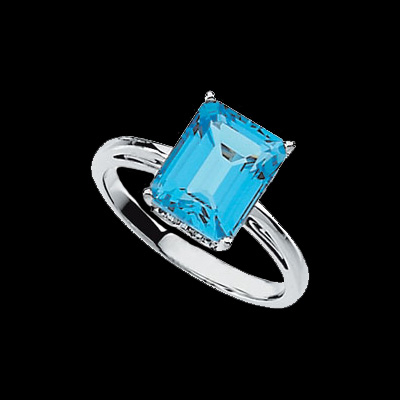 Pretty 14k White gold Swiss Blue Topaz ring. Trillion cut 8mm blue topaz is AA quality vibrant stone. Simple, clean, stylish ring. Ring is stock size 7 and weighs about 3.9grams. 14k White gold Swiss Blue Topaz and 1/4ctw diamonds. Trillion shape Swiss Blue Topaz measures 8mm accented in a diamond border with additional diamonds on either side. 14k Gold London Blue Topaz stack-able ring. 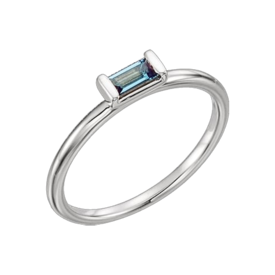 This simple ring features an east to west set 5x2.5mm straight baguette London Blue Topaz. This ring is available in 14k white, yellow, or Platinum. Magical 14k gold London Blue Topaz and diamond ring. Beautiful split design ring is set with a vibrant 7mm round London Blue Topaz and accented with 1/8ctw diamond halo. Special order this ring is 14k White, 14k Rose, or Platinum metals. 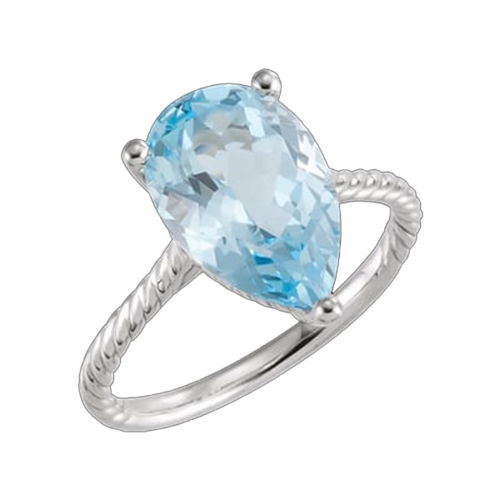 Beautiful 14k white gold London Blue Topaz ring. 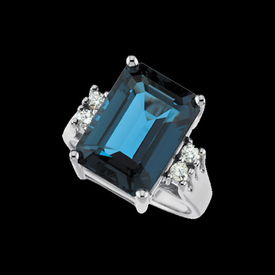 Large 10x8mm emerald cut center is the focal point of this bold ring. Ring is accented either side with 6x3mm unique cut London Blue Topaz gems. Diamond accents total .03ct and are a nice addition. Ring measures 17.8mm across the top, 3mm wide at the shank then tapers down to 1.75mm at the base. A Vibrant gemstone ring. Great 14k white gold Sky Blue Topaz rope design ring. Sky Blue Topaz is an incredible faceted pear shape that measures 14mm x 9mm. Topaz sits in a rope design ring. 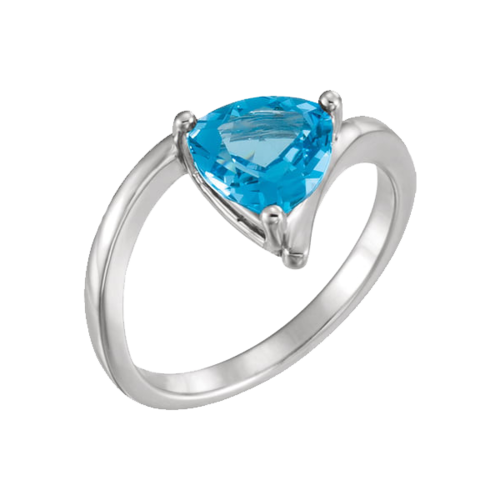 Casual, vibrant Topaz ring. This great design is also available with an Amethyst center. 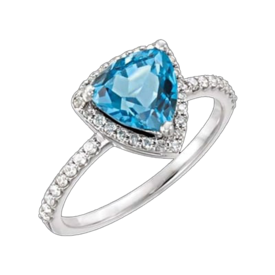 Stunning Swiss Blue Topaz and Diamond Ring. 14k White gold is set with a very large 16mm x 12mm Swiss Blue Topaz and 1/2ctw diamonds to create this big beautiful ring. Custom order this in 14k Yellow or Rose gold. At the base of this ring it measures about 2.85mm in width and 16.7mm wide at the top. Stock size approx. 7. 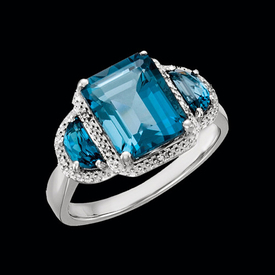 14k White gold London Blue Topaz and Diamonds create this lovely ring. Topaz is 3.7 carats and measures 10mm x 8mm. Accent diamonds total .10ctw. Brilliant design, 14k two tone gold Blue Topaz ring. Blue Topaz is a trillion cut shape and weighs 2.77ct tw. White stone accents in this design are actually white topaz. Such a beautiful twist design, you'll love this ring. Blue Topaz is the birthstone of December. 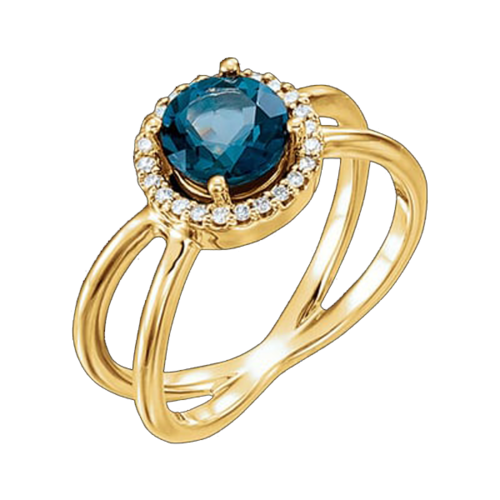 Vibrant Blue topaz and 14k gold ring. 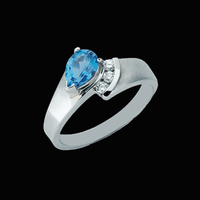 Blue topaz 3 stone style ring features a larger oval blue topaz center with a slightly smaller topaz either side. Topaz is the birthstone of December and the official 4th wedding anniversary gemstone. The ancient Greeks though Blue Topaz gave them strength and in the Renaissance period, people thought topaz could break magic spells. Topaz total 2.75ctw. Available in 14k yellow or white gold. 14k White gold Swiss blue topaz ring. This white gold ring is set with a large 10x8mm genuine Swiss Blue Topaz. Lovely 14k White gold ring with a crossed shank design features a Blue Topaz center that weighs aprox. 6.10ctw. Center stone is bordered by 62 diamonds totaling aprox. .30cts. and continues half way down the shank. Pretty Pear shaped Blue Topaz set at an angle and accented with .11ct tw SI 1 clarity G color diamonds creates this great ring. Blue Topaz weighs aprox. .85ct tw. Ring is also available in 14k Yellow, 18k, and Platinum metals, email for pricing. 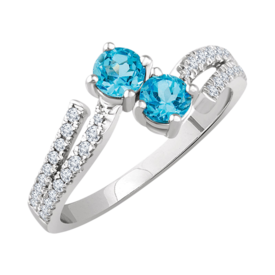 Exquisite 14k white gold London blue topaz and diamond ring. 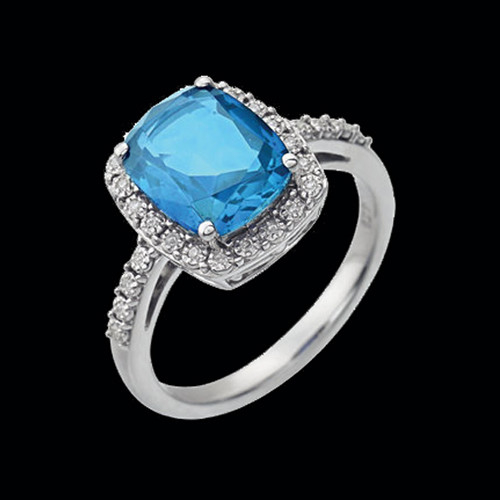 Genuine London blue topaz is the luscious focal point in this gemstone and diamond ring. Topaz is an emerald cut faceted AA quality gem that measures 14mm x 10mm and is about 8.5 carats. Simply sensational. Incredible Blue Topaz Diamond Ring. Genuine checkerboard Sky blue topaz and diamond ring. Incredible large 18mm x 13mm oval blue topaz gemstone is the focal point in this ring. This beautiful sky blue topaz is 15 carats. Diamonds total 1/2ct tw, are full cut round and I1 clarity H-I color. If you like a big gemstone ring look, you'll Love this ring. Vibrant Blue topaz and diamond ring. This 14k white gold ring is set with a large blue topaz gemstone that weighs 9.10 carats. Beautiful blue topaz is bordered with 30 diamond that total 1/4ct tw. You'll love this exciting ring. Lovely 14k white Swiss blue topaz and diamond ring. Gorgeous Swiss blue topaz is a 11x9mm oval great quality gemstone and accent diamonds total 1/6ct tw. 14k white gold in this ring weighs 4grams.